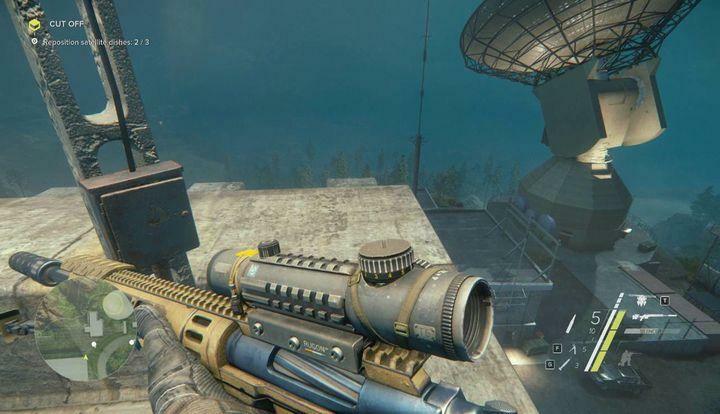 Sniper: Ghost Warrior 3 game guide includes a detailed description of storyline and origins of the main hero. All were described in great details, and one should keep in mind that you can complete it in several ways. 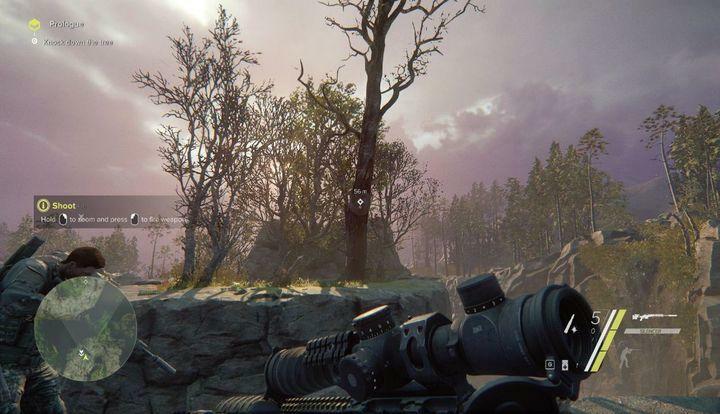 Regardless whether you decide to eliminate enemies with your sniper rifle or an assault rifle, the game will award with skill points that match your game style. The first couple chapters will focus on these skills. Thus, your main abilities, gear, gadgets and the crafting system will be explained. Apart from main quests, the game guide will include description of side quests that can be found in each of the four acts. You will be provided with a description of tactics that would match each mission best, and rewards that you will be granted with. Furthermore, useful tips on locations and equipment that one should carry, will be provided. Further chapters will be devoted to collector’s items, scattered across the available area. You will find maps that will mark key locations. Gamers who are willing to complete 100% of the game will find these chapters extremely useful. The final part of the game guide will be devoted to game performance and system requirements. 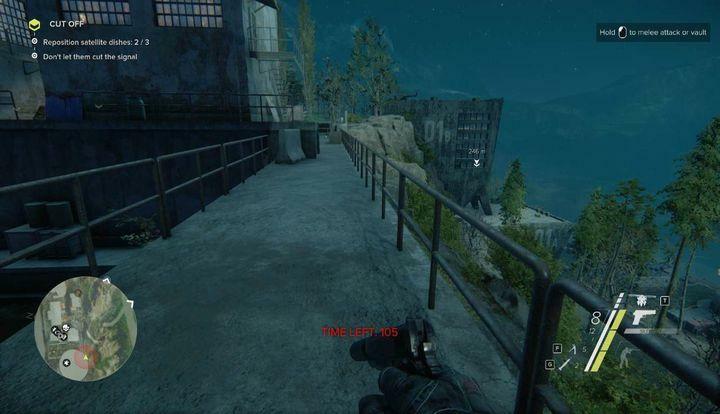 Controls of Sniper: Ghost Warrior 3 Sniper: Ghost Warrior 3 Guide. 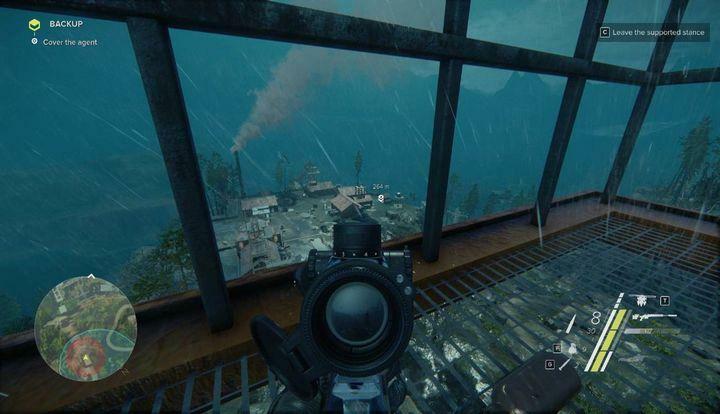 Prologue | Act 1 | Walkthrough Sniper: Ghost Warrior 3 Guide. Remains of the Day | Act 2 | Walkthrough Sniper: Ghost Warrior 3 Guide. 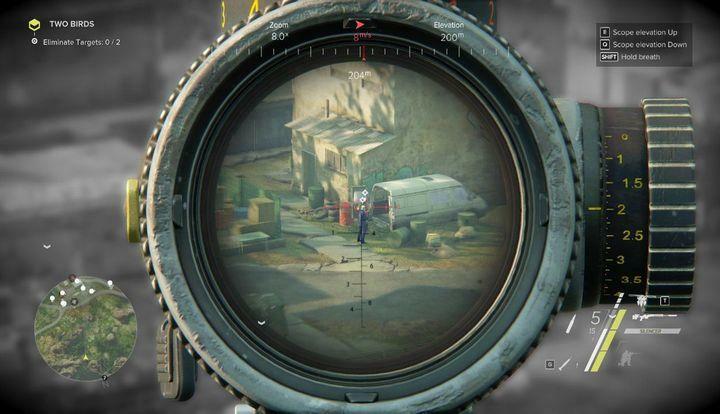 Skills in Sniper: Ghost Warrior 3 | Gameplay mechanics Sniper: Ghost Warrior 3 Guide. Blockout | Act 1 | Walkthrough Sniper: Ghost Warrior 3 Guide. 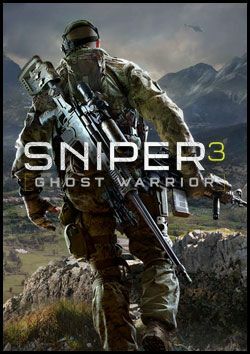 Sniper: Ghost Warrior 3 is the third installment in the popular first-person shooter series dealing with snipers, launched and developed by the Polish CI Games. In contrast with the previous installments in the series, Ghost Warrior 3 puts a much greater emphasis on freedom of action. In the game world, apart from the main storyline, there are tons of side quests available, and it is entirely up to us to decide their importance and when, if ever, we feel like undertaking them. While playing, we traverse vast wildland areas, negotiate with conflicted sides, and eliminate people who are key to the plot development. Traditionally, we employ a wide arsenal of faithfully recreated sniper rifles and cutting-edge military hardware, such as drones that can be used not only to scout ahead, but also to disarm land mines or hack cameras. 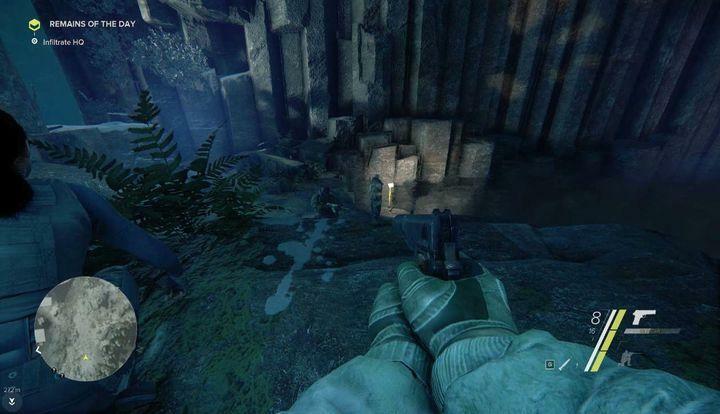 At the same time, the gameplay features numerous survival elements. The freedom of action allows us to eliminate our targets in many different ways. 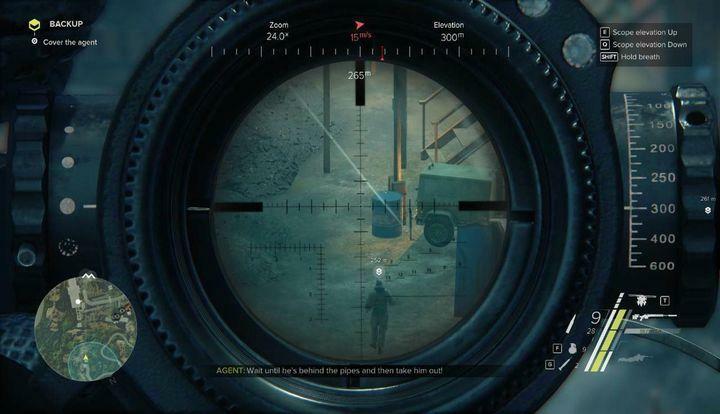 As befits a sniper game, the discrete methods are the most effective ones. According to the “you cannot kill what you cannot see” principle, the most profitable approach involves stealthily in sneaking behind our enemies’ back and eliminating our targets in a way that does not raise suspicion. Traditionally, one of the most important elements of the gameplay is the incredibly advanced recreation of bullet trajectories. 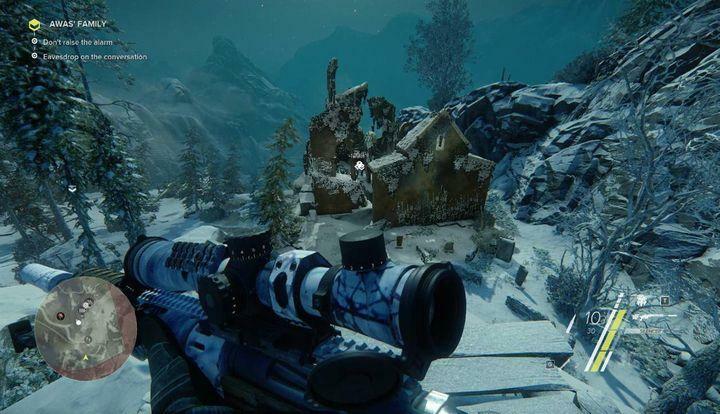 Sniper: Ghost Warrior 3 developer is not faring too well. The company spent a lot of money on the game’s marketing. However, its current reviews are not very favorable. 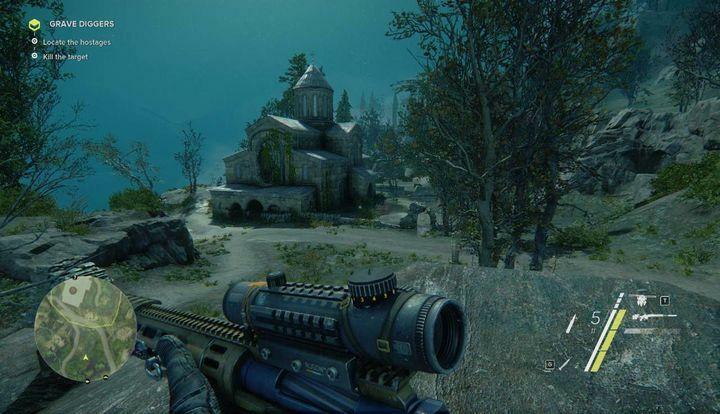 Sniper: Ghost Warrior 3 players are probably eager to receive the first patch to the sniping first-person shooter released this week. The update brings about a bunch of bug fixes. 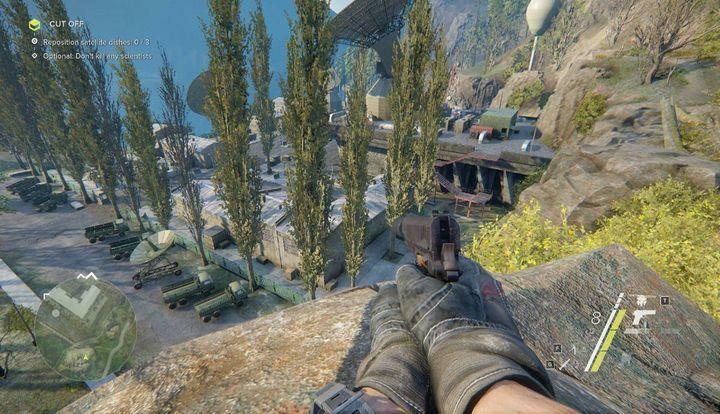 Sniper: Ghost Warrior 3 is going to have an open beta, in which players will test two single player missions: military base infiltration and assassination of a key target. 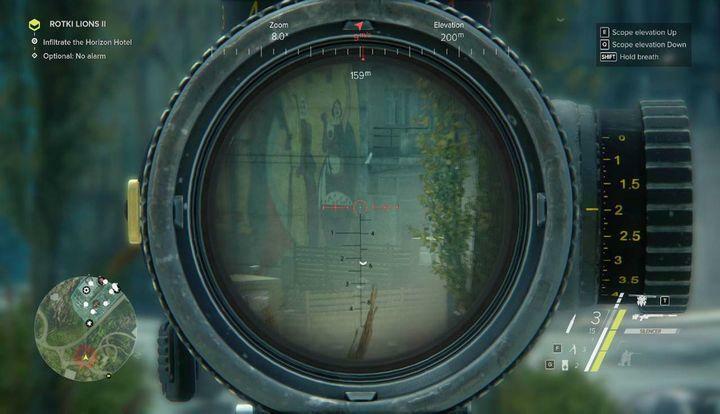 Sniper: Ghost Warrior 3 is coming out a couple of months later, on April 4. The delay has been explained by the developers wanting to properly optimize the game. 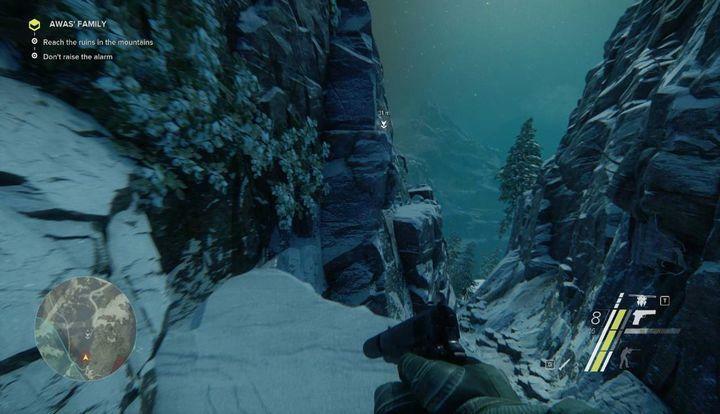 Sniper: Ghost Warrior 3 has just received the first gameplay trailer. We also have some fresh info on the game’s sandbox mechanics, progression system, and more. 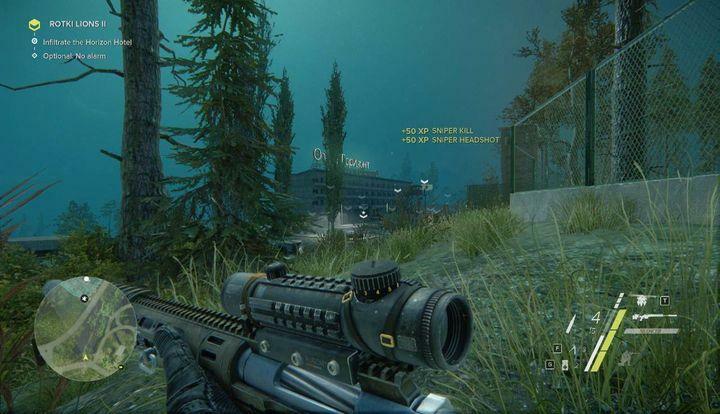 Skills in Sniper: Ghost Warrior 3 were divided into three categories – Sniper, Ghost and Warrior. The first category – Sniper, refers to all the skills that will be useful for a sharpshooter. 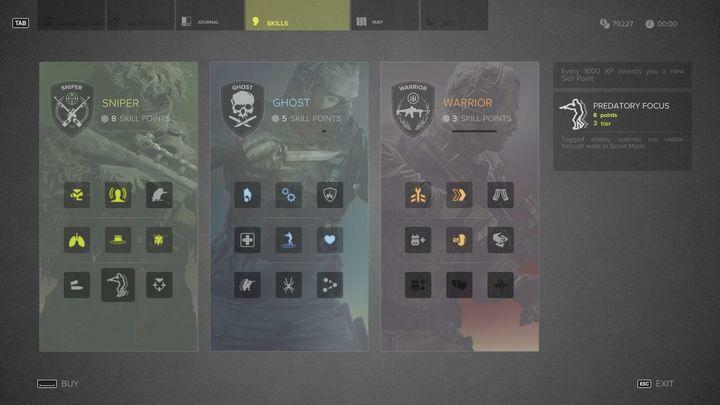 Ghost category, will affect your ability to sneak upon your enemies and eliminating them silently with your knife. The last category – Warrior, will improve abilities typical for a soldier, who uses an assault rifle or grenades and gadgets of mass destruction. Each group of skills was divided into three rows (nine skills overall). The first row will be unlocked automatically once you finish the prologue. In order to use the other two sets, you will need to gain enough skill points (second row – 4 points, third row – eight points). Echolocation will make incoming noise (such as footsteps or voice) “visible”. Increases gathered items by 50%. Increases lung capacity by 50%. You will be able to aim and hold your breath for longer. Containers with items are visible through walls in Scout Mode. Unlocks additional slot for your drone. Reload your sniper rifle 20% faster. You can see people through walls in Scout Mode. 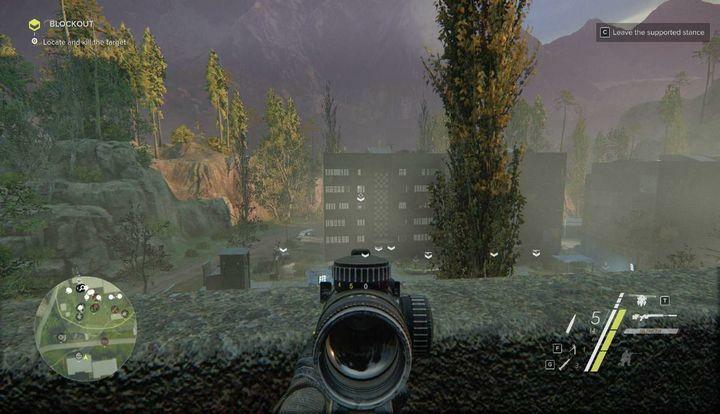 Use Scout Mode to check line of sight of hostile snipers. Automatically search fallen bodies with a knife. Crafting traps requires less resources. Provides one additional health bar when using medicine. Location of first-aid kit will be marked on your map. Jumping and walking generates 50% less noise. Permanently adds one additional health bar. Your movement while crouching will increase by 20%. You can climb 20% faster. 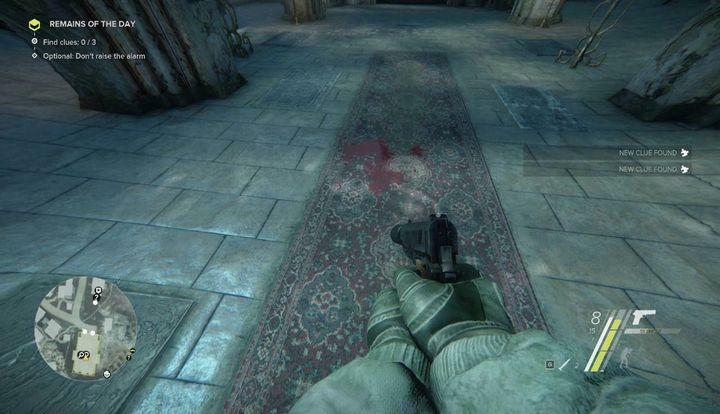 Removes the limit of enemies that can be killed in a row with the knife. Crafting ammo costs less resources. Your stamina decreases at a slower rate. Additional ammo clip for your assault rifles. One additional slot for your gadgets. Better prices when purchasing gadgets and ammo. You reload your weapon 20% faster. Additional slot for your gadgets. Unlimited stamina, if you are down to your last health bar. Specific actions were assigned to each skill group. Performing these activities will let you gain experience, needed to obtain more skill points. 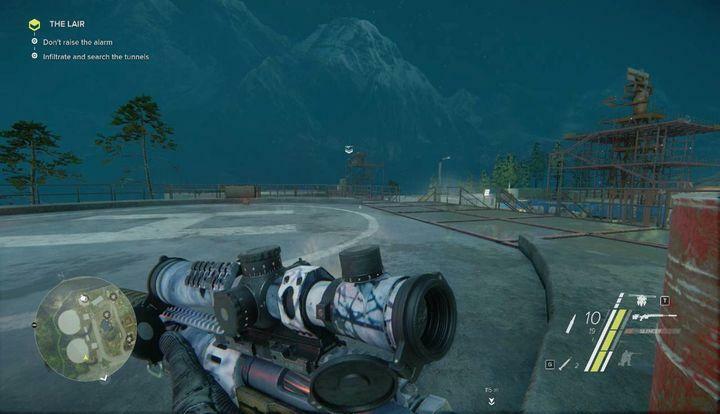 Sniper – you will gain experience for killing enemies with your sniper rifle, head shots (sniper rifle) and eliminating enemies located further than 200m away from you. 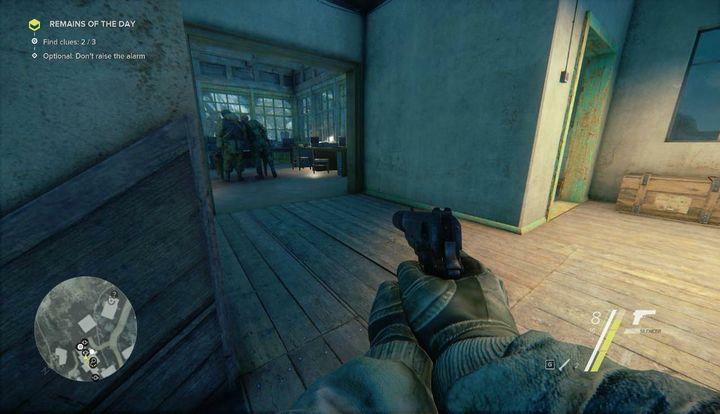 Ghost – you will gain experience for killing unaware enemies with your knife, head shots with your pistol and interrogations. Warrior – you will gain experience for killing opponents with your assault rifle, bombs and grenades, or destroying hostile facilities and vehicles. 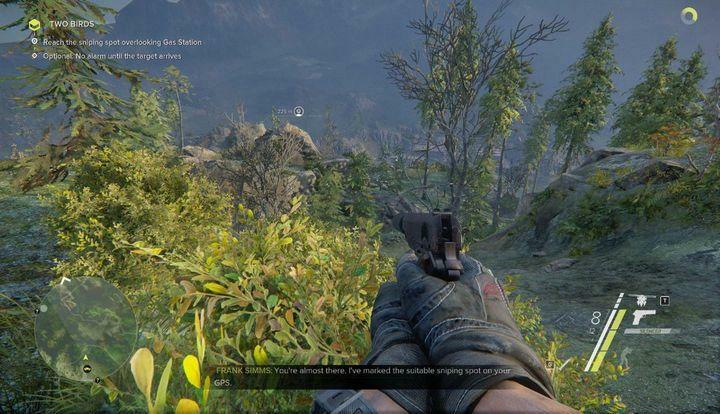 In Sniper: Ghost Warrior 3 you will come across various pieces of equipment: both weapons and gadgets that will help you during your missions. You can unlock them by completing main quests. In act three you will obtain all the available weapons and it is not possible to speed up the process. 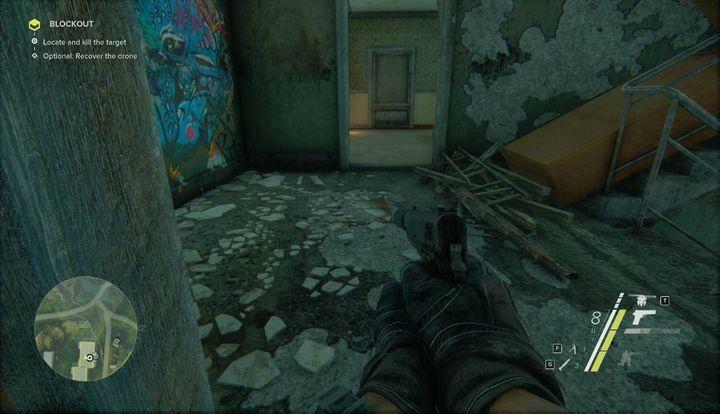 In order to change your change your weapons or go through the available gadgets, you will have to go to the hideout and use “Weapon Cache”. Manage your weapons and learn about useful items. Let’s focus on your primary weapon – your sniper rifle. Since this is your main weapon, you should purchase better rifles and/or modules when possible. The rifle scopes are likely to be the key type of modification and the more expensive they get, the more deadly they become. 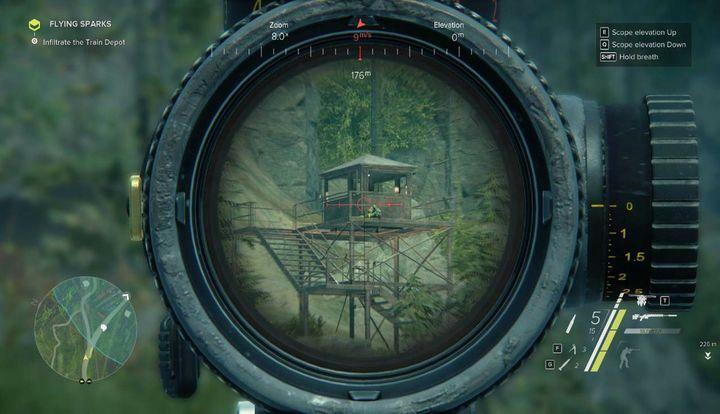 Better rifle scopes provide you with better zoom. Other accessories include ammo clips, Stands, laser scopes, Silencers, and even weapon camouflage. You can modify each item as you wish. One should notice that better sniper rifles are not only more expensive but they will use different types of ammo. Your standard ammo is 7.62mm and it will work for all the basic rifles. Powerful caliber .50 rifles will let you destroy anything that stands in your way. There are many gadgets to choose from and you can adjust them to your own needs. If you are a typical sharpshooter, you should focus on devices that can repair Silencers, Night-vision device, throwing knives or hacking modules for your drone. 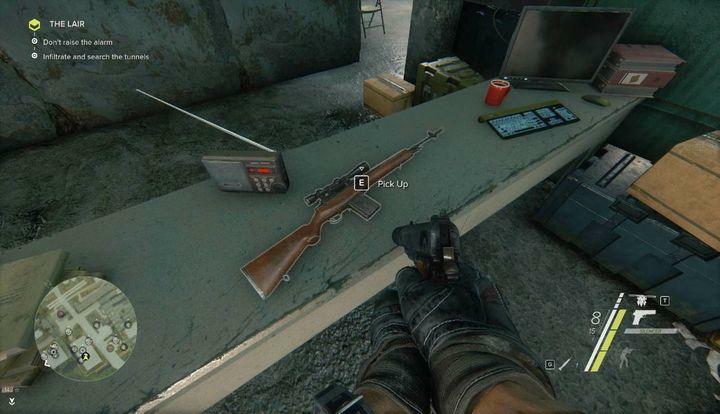 However, you can always add explosives, grenades or anti-tank mines to your inventory. You decide how much space you want to use. The crafting system is all about gathering items scattered across the map (most of them can be found during main missions and while taking back hostile outposts) and using useful items to achieve that. 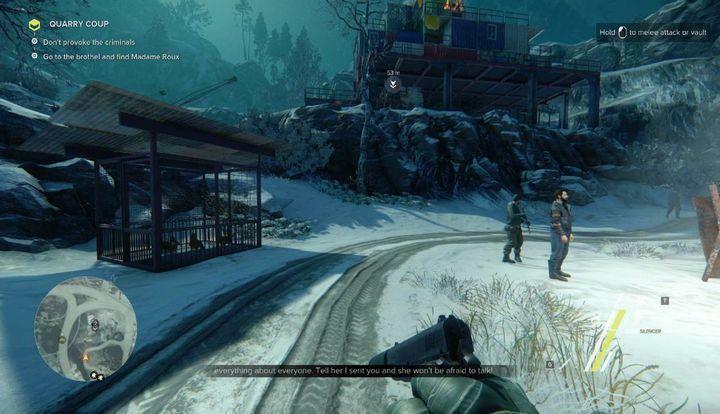 This mission serves as an introduction to the actual game. 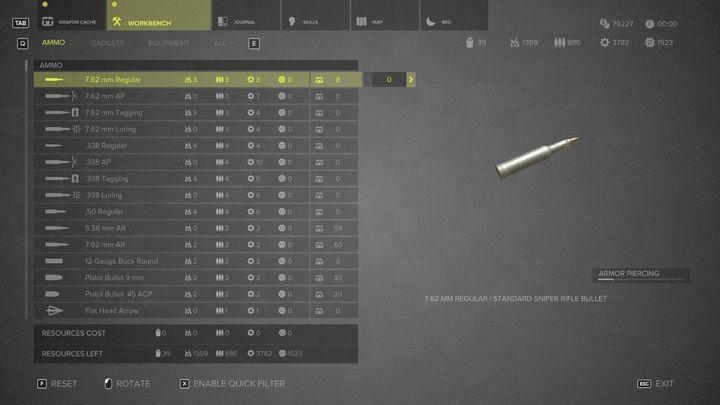 All the privileges, such as the dot of your scope, which shows exactly where the bullet goes, can be switched off in other missions (this depends on the difficulty level – easy will keep these settings, while the other two will not). Get use to the controls and follow Robert. 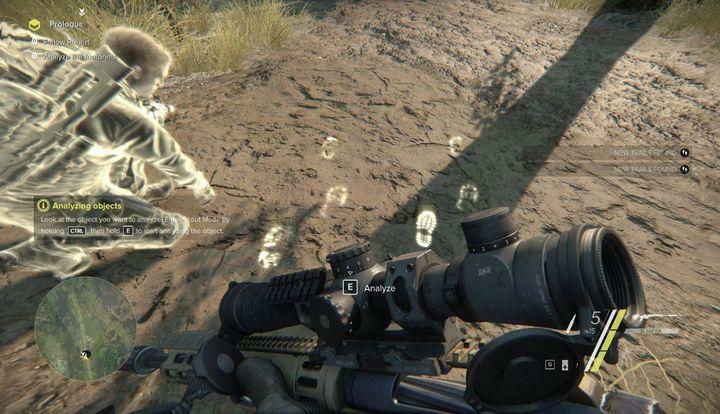 At one point he will ask you to scan the area, so use the scope attached to your rifle and drag it to the marked spot. Do that and move towards the right side of the cliff. Now enter Scout Mode to search the area for clues. You will find out that you can climb the neighboring wall, so use it to reach the next checkpoint. On your way, you will attacked by a wolf and the only way to free yourself is killing the animal via pressing the right buttons (presented on the screen). Now, you will have to pass an abyss. Select explosive ammo XM2015 and hit the tree located on the other side. Your next task will be to crouch and hide in the nearby bushes from the incoming helicopter. At this point you will come across a pack of wolf and you will have to possible means of dealing with them: you can listen to Robert and sneak past them, and engage in combat and kill them. The choice is yours to make. Reach the next hill and you will have to analyze some objects. Use this mode to find footprints. Follow them and you will find two hostile soldiers. Your task will be to take out the enemy on the right silently. In order to avoid his line of sight, move to the right and once you eliminate your target, take the drone from your brother. Use it to tag six enemies located nearby. Two of them are located on the buildings and three more are on the ground. Robert will mark targets that you are supposed to eliminate first, and thus get to know aim and fire mechanics. Your first target will be located over 250 meters away from you, so adjust elevation on the right of the scope to 250 and only then take the shoot. Draw your attention to the fact that the red dot will tell you where the bullet will land. 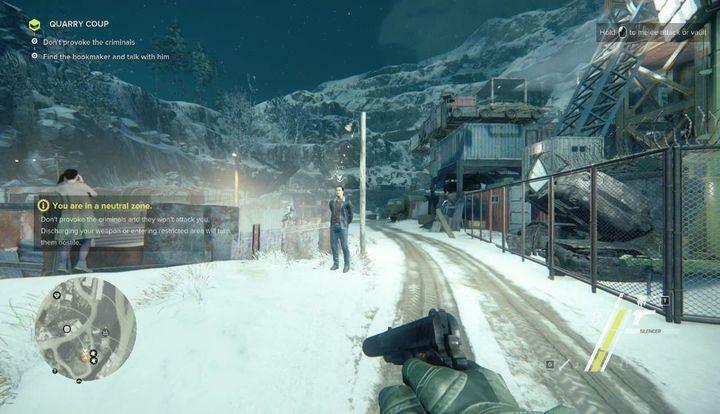 A bullet fired from such a distance will be affected by the wind (Coriolis force was overlooked), and if you play the game on hard or challenge difficulty level, you can only relay on the information on the wind. Eliminate the remaining targets in the same way. To take out the third target you will have to wait for the patrol to split up. In case of the fifth and sixth target, you will have to aim for the head of the first one in order to kill the soldier in front of him. 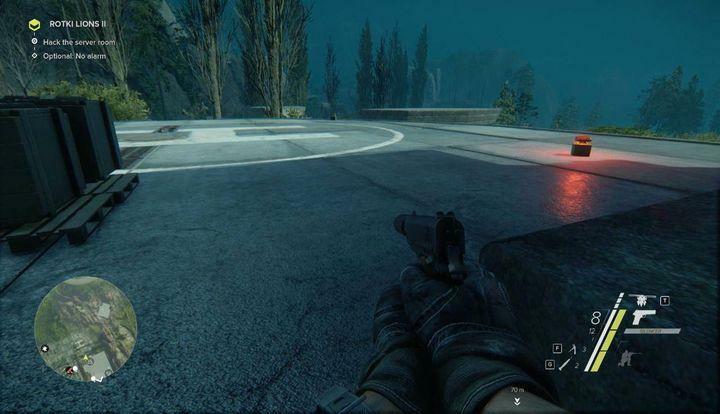 Reach the facility and sneak up to the soldier and interrogate him. You will learn interesting things about soldiers patrolling the area. Just let the soldier finish the phone conversation. 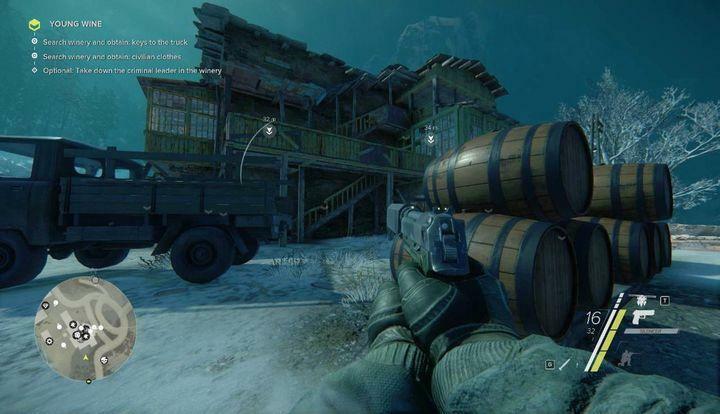 As soon as you get inside, change your weapon to the assault rifle and eliminate all the nearby enemies. Move forward and you will come across a chest that can be used to get into the CCTV server. Use this to find the location of remaining enemies. Eliminate them and plant explosives in the marked location. Exit the area with Robert to complete the task. 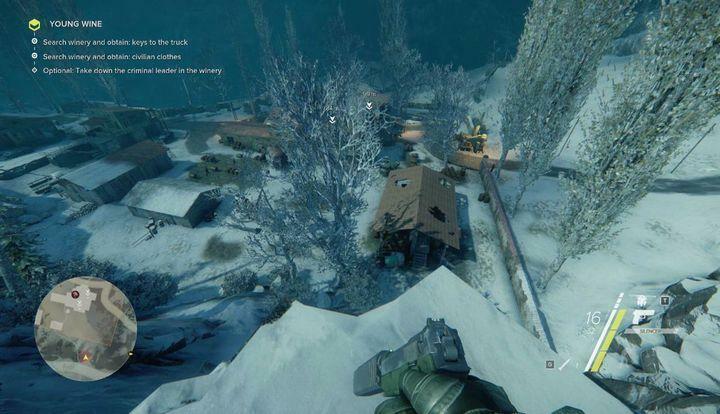 Once you begin the mission, you will have to reach the hideout presented on your mini map. There is a laptop which will allow you to accept your first main mission in the game. Reach the spot marked by your informer, and wait for our target to appear. Wait for the confirmation, activate your drone and scan the surrounding area. You will notice a sniper on the left, by the rocks – deal with him first. 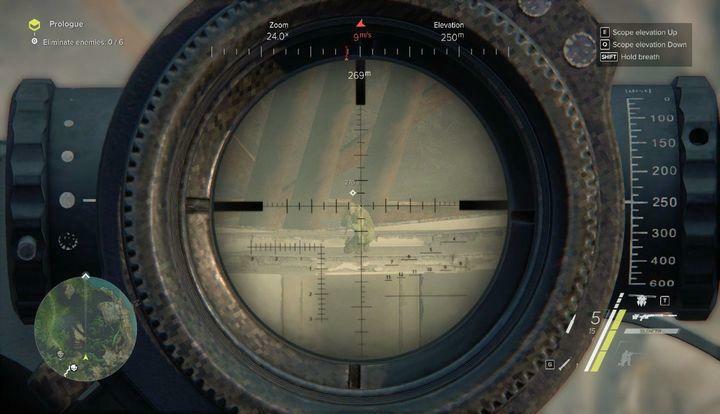 As soon as you deal with the sniper, you will be able to take care of your targets. You can take out both leaders with a single bullet, so aim for the head of the first target, when he is in front of the other soldier. Similar to the prologue, remember to adjust your scope according to the distance and wind. If you did all the steps correctly, your targets should die with a single bullet. You will have to leave the area once the targets were eliminated. We do not recommend that as you could deal with the remaining resistance forces (the first facility). Your current location is excellent and you can fire at any enemy from here. Just pay attention to the mortar on the left. This will grant you some exp. 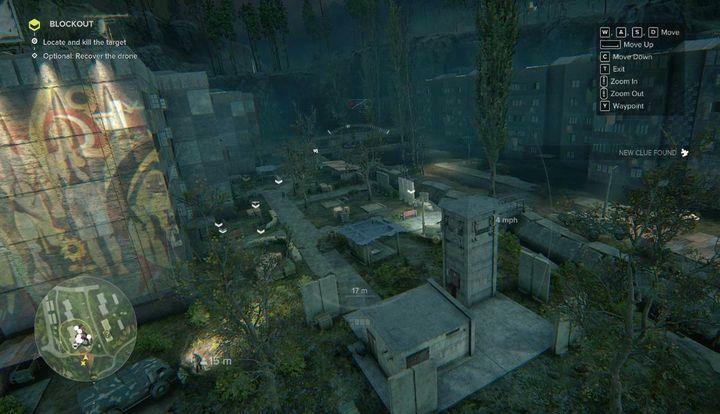 from the “Sniper” branch and once the last soldier is dead, access the facility to collect crafting materials and weapons (AK-47 is a must-have). Just like in case of your previous mission, you will have to go back to your hideout and use the laptop to gain access to this task. Once you reach the starting point, you will be presented with the view from the screenshot. Your task will be to rescue civilians who are digging their own graves. 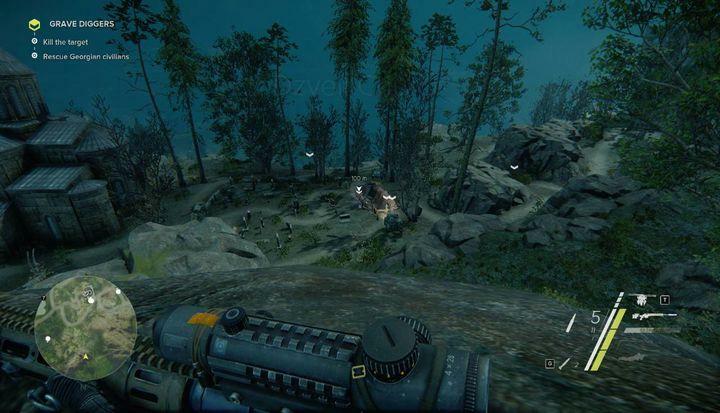 In order to learn more about the surrounding area, head right, climb the rocks and use your drone to tag all your enemies (see screenshot). 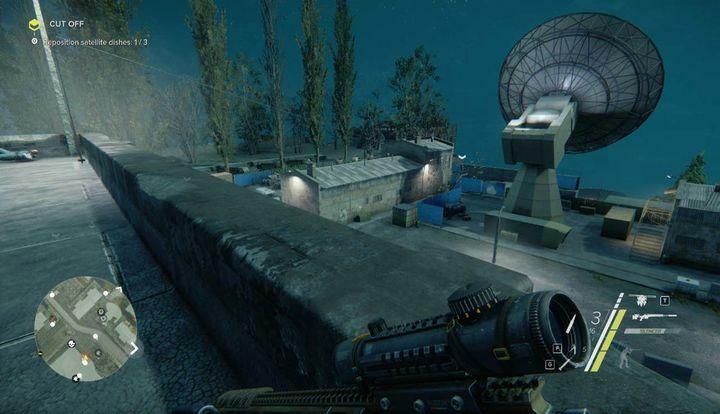 From this spot, you can use your sniper rifle to take out all the bad guys. First, eliminate the soldier standing across your position, by the abyss. Your next target should the soldier patrolling the right part of the area. Wait for him to move away from his fellow soldiers in the middle and shoot. Once all five opponents are dead, meet with the civilians in the center and speak with them. You will learn about the location of your main target. Your target will be waiting in the main part of the church. Head to the main entrance and use your sniper rifle to eliminate all the soldiers in the building. By doing that, not only will you complete your main task but you also will clear out another enemy facility. Get back to the civilians and speak with them one more time to rescue them. The mission will end once you leave the area. Just like in case of your previous missions, you will have to go back to your hideout and use the laptop to gain begin your next task. You will need to eliminate a target marked by JSOC – in a fortified town marked on your map. Reach your destination and once again use your drone to scan the surrounding area for pieces of information, enemies and tactical options. 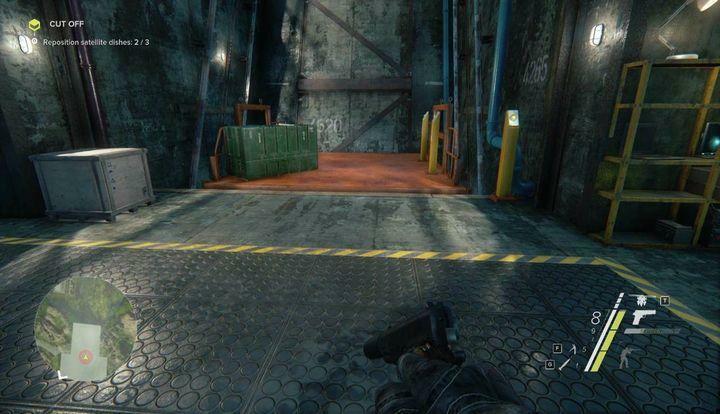 There are many enemies in the area and there is another hostile facility that you can take over. If you are a typical sharpshooter, your best spot is probably the opposite building. Use your drone to locate a perfect spot on its roof. However, in order to get there, you will have to go through a maze. Keep in mind that Igor Krustchev is located in a building occupied by hostile snipers, who will monitor the building you are about to access. If you don’t want them to spot you, use the window on the opposite side of the building (see screenshot). One of your enemies is located just round the corner, and he can be easily eliminated with a knife. Thus, it is crucial that you remain in stealth mode. Another opponent is located on the mezzanine. To reach the upper floor, use the wardrobe presented in the screenshot and use the hole in the ceiling. Jump left, where a passage to another room is located. There, you will find a collector’s item – Thin bracelets. From now on, you will need to pay attention to the sniper located in the opposite building. 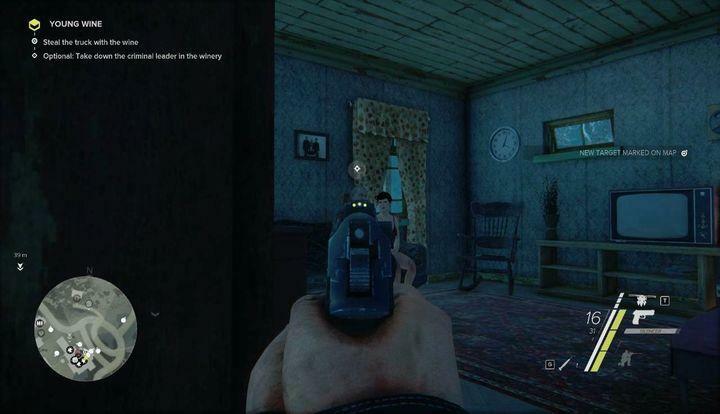 You can shoot him right away, or move to the neighboring room and access the upper floor by wardrobes located under a hole in the ceiling (see screenshot). Reach the upper floor and you will come across blocked stairs. Head to the next room where you will find the only balcony on this floor and hang on its railing to jump to the planks on the left. Use them to reach the top of the building. There you will find the JSOC drone that you will need to recover in order to complete your side quest. 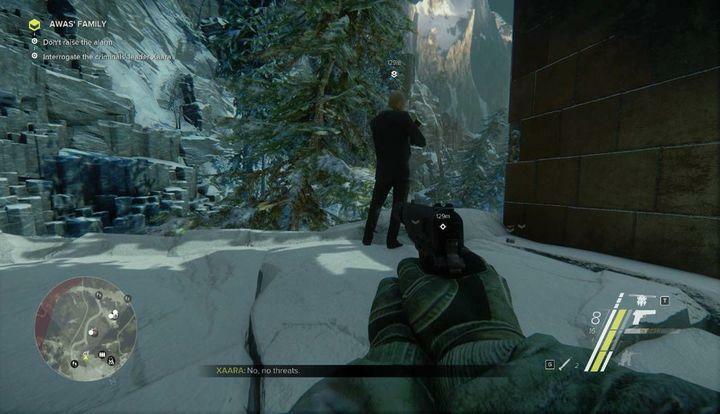 Furthermore, this is a perfect spot to take out the hostile sniper and your main target – Krustchev. The very Krustchev is located on the last but one floor, on the left of the building. The roof is the perfect place to take the shoot. 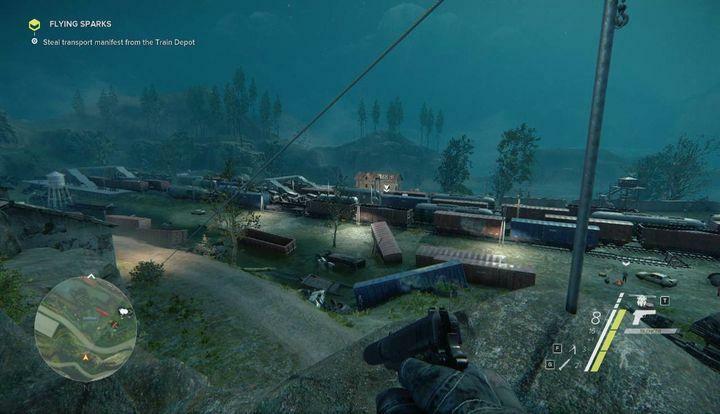 Eliminate your target and you will have two options: use the rope attached to the roof, right behind you (and quickly slide down), or eliminate all hostile soldiers in the area (and thus clear out another hostile facility). Regardless of your decision, you will have to exit the location to complete your mission. Your task will be to infiltrate hostile facility and obtain secret data. Just like in case of your previous missions, you will have to go back to your hideout and use the laptop to gain begin your next task. 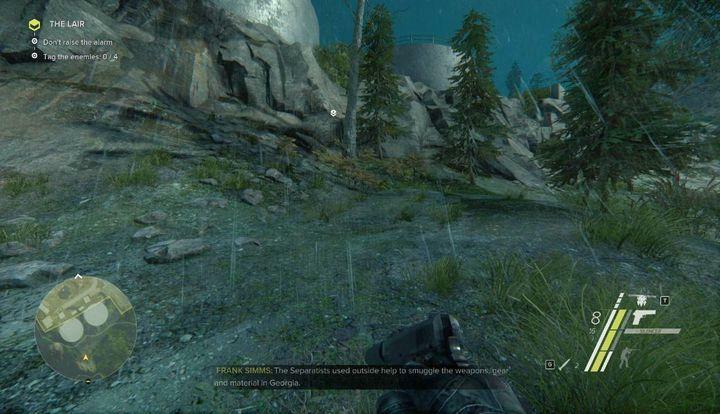 Head to the place marked on your map and you will reach hostile area presented in the screenshot. You will have a view of a large part of the facility, thus use your drone to scan the surrounding area. The spot behind the first satellite is a perfect place to fire. Wait for the soldier, who is patrolling the roof, stops by the left edge and take him out before you eliminate the enemy by the ventilator. Once both soldiers are dead, use the rope attached near you, and jump down. Here, you can take care of the first satellite. Remember! Your side quest suggests that you are not allowed to kill any scientists. In order to change the satellite’s position, you will have to interrogate the scientist located by the computer in the right moment. This would be the moment when the other scientist turns away from you. It is also important to pick up the unconscious scientist and hide his body behind the wall. This way you won’t alarm your enemies and the option task will remain available. To reach another satellite dish, you can use the following path. The main advantage of this choice is that you will be able to secure the area of hostile units, which will be very useful later on. Head to the location presented in the screenshot – the roof where the first satellite dish is located, on the left. There is a rope that will take you to a roof a small building on the other side. Before you proceed, you can take care of two soldiers, patrolling the area near the satellite dish (so that they won’t notice you as you will be making your way to the other side). Use the roof to reach the end of the path. There is a fence that will prevent you from moving to the next sector and a corridor that will take you to the second satellite dish. The spot presented in the screenshot is a perfect place to take another shot. However, there is a guard at the end of the road. As soon as you reach the other side of the location, go inside and wait for the two scientists to split up (see screenshot). The scientist on the left is standing by the server and the one on the right is on his way to the right side of the room. This should give you enough time to reposition the satellite dishes. Once this is done, you will find out that there is another action and you only have 120 seconds to do that. Take the same corridor that you used to get here, and you will find a small passage to the rocks, on the right. There is a rope that will take you to your destination. As soon as you go through the window, kill two guards by the computer. Now use the device to stop the signal. The whole activity should take you about 60 seconds, so you should still have plenty of time to plan your moves. 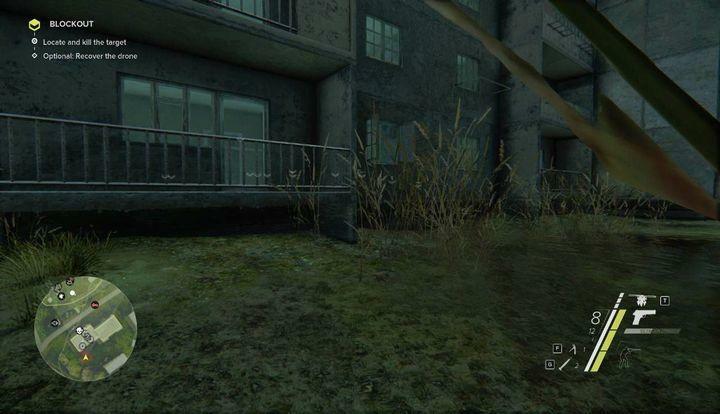 Use the elevator presented in the screenshot (the button is on the yellow pole) and get out of the building. There are some heavy-armored soldiers at the landing ground, so be careful. This is a good place to use your drone if you have not scanned the area already. Kill your enemies, reach the lower levels and get to the last satellite dish. Just like before, you may have to incapacitate one of the scientist to complete the side quest. Once you complete your task, exit the location. 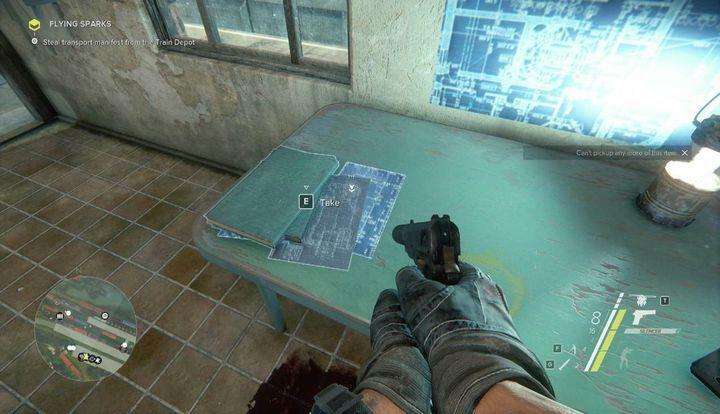 Accept the mission by using your laptop in the hideout and reach the train station marked on your map. As soon as you get there, scan the area with your drone. Draw your attention to a sharpshooter located in the left part of the area (see screenshot). Inside the facility, there are a dozen or so armed soldiers. Your task is to reach the main building, located on the right side of the area, and steal transport manifest. Climb the rock on the right and reach the spot presented in the picture. Not only will you have a clear view of the surrounding terrain but you also will find a rope that can be used to reach the lower level silently. You can move from the presented place (after eliminating the first soldier) to the other side of the location. 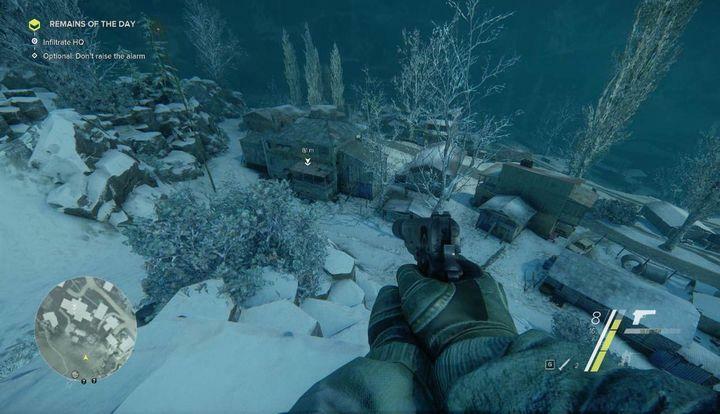 On your way, you will notice an enemy standing on the elevation. You should eliminate him before moving forward. There is another enemy, hidden between some carriages. He has some interesting pieces of information, so interrogate him and head towards the building. Inside there is a single enemy and the manifest, on the table. On the first floor, you will also find another collector’s item – Golden Pin. Once you pick up all valuable items, head to one of two available fuel tankers, and drain the fuel. You will come across some soldiers on your way but they shouldn’t cause too much trouble. Drain the fuel, head to a safe position (as far as possible from them), and shoot at both fuel tankers, to cause fire. Now, all you need to do is to leave the area. 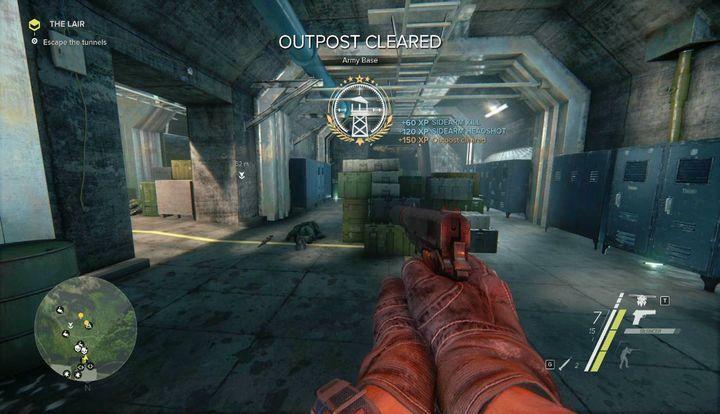 You can also eliminate the remaining enemies and secure another hostile facility. Your next three tasks will take place one after another. Once you accept mission “Meet the Team” in your hideout, you should head to tunnel marked on your map. When you reach the new location, you should go to your new hideout and meet with your team. This task will be completed automatically after a short cut scene. Use the laptop, accept main quest “Young Wine” and head to a small town marked on your map. Your task is to obtain two things: civilian clothes to disguise yourself and a wine truck that will grant you access to the wedding. Reach your destination and climb the rocks presented in the picture. 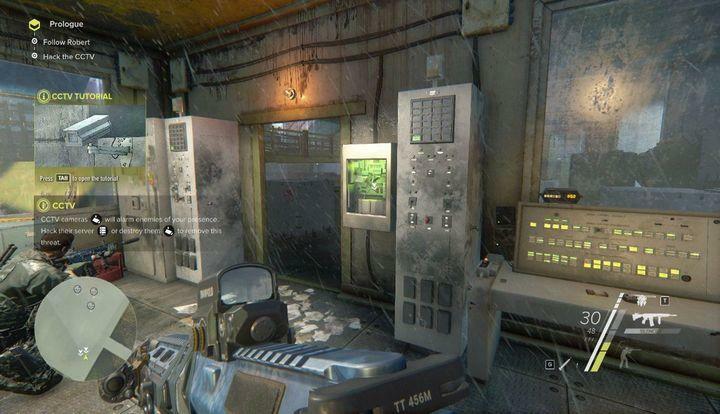 There you can use your drone to scan the facility for useful information and enemies. There will be several enemies in the area. First, take care of a guard standing by the gate. Although other soldiers are not likely to notice him, you may want to destroy the source of light above him. Right next to him, by the gate, there is another opponent. You should interrogate him as he can provide you with some useful pieces of information. 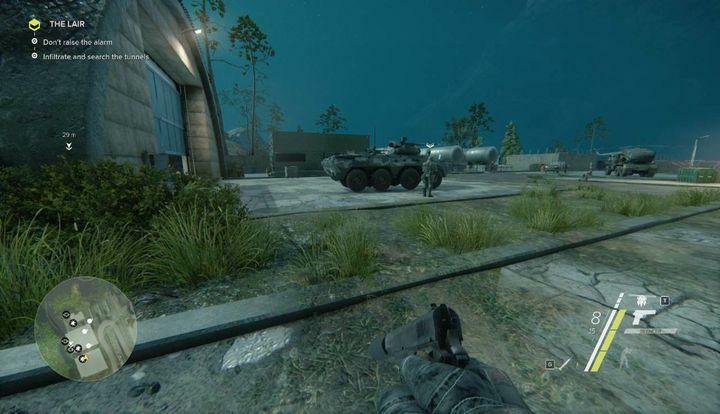 Approach the main building, located in the middle of the area, and wait for the guard presented in the screenshot to move behind the vehicle. It’s a perfect opportunity to get rid of your opponent. Another soldier will be protecting the area on the right of the main building. Take him out with a headshot and don’t worry, nobody will look for him. Get into the house and use the stairs to reach the top floor. There is a guard on the right side that you can totally ignore. He is busy talking to a woman. In the neighboring room however, you will find the disguise you were looking for. Truck keys are located on the opposite side of the same floor. Before you actually leave the building, you can complete your optional task. You are supposed to eliminate a target located on the ground floor. A headshot should be enough, and the woman he was speaking with will not complain. You can also secure another hostile facility – the Winery, before you proceed with your quest. There aren’t too many guards left in the area, so it’s wise to eliminate them before you move on. As soon as you are ready, enter the vehicle and head to your destination to begin Big Fat Wedding. The quest is nothing more than a cut scene, so all you need to do is get to the church and watch the ending of act I.
Rotki Lions I will be available once you complete your main mission Blockout. After receiving a voice message and speaking with Rotki, head to the yellow exclamation mark visible on your map (located in Mining Zone). Accept the mission, use the car and go to your destination. You should reach the spot presented in the screenshot. 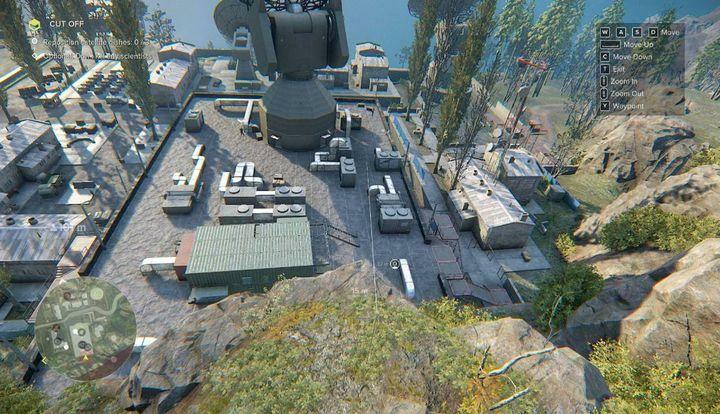 You have a perfect view over the entire facility. Your task is to steal the supply truck and bring the goods to civilians in a specific location. In order to do that there are two things that you need to complete. First of all, you need to secure the outpost, which means killing all the separatists. Then you will need to find keys. Before you engage into battle, use your drone to tag all hostile units in the area and start eliminating soldiers, who have no shields or cover. One of them is by the mortar and two more can be found on the right side, by the entrance. Keys to the truck are in the barracks, on the left of the lumber mill. The truck is on the opposite side of the building. Deliver the truck to the location marked earlier by Rotki. Accept Rotki’s second mission by going to the hideout and interacting with your laptop. Head to your destination. Before you move forward, use the drone to scan the area for useful tips and hostile units. 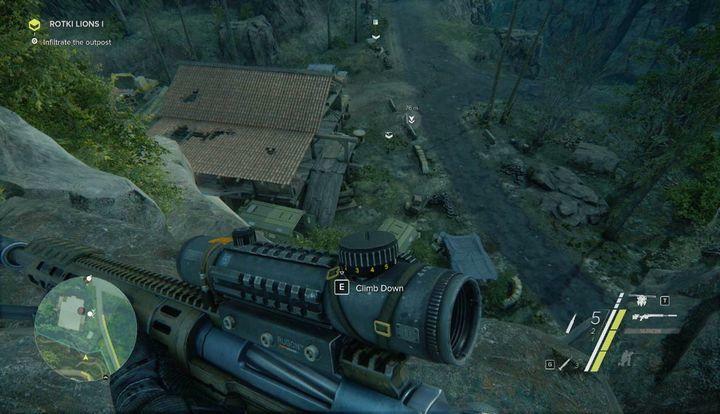 Focus on the roof of the main building, and locate the enemy sniper. Quickly eliminate him before he notices you. On the left of the building, there is a security camera that monitors the entrance and a soldier who operates it. Destroy the camera and wait for the soldier to move behind the car and check what is going on. Eliminate him as well. You can now easily enter the building and find a scientist who needs to be interrogated. Right under the camera, you will notice stairs to the basement that will take you to the staircase. Your task is to reach the last but one floor and where the scientist is located. 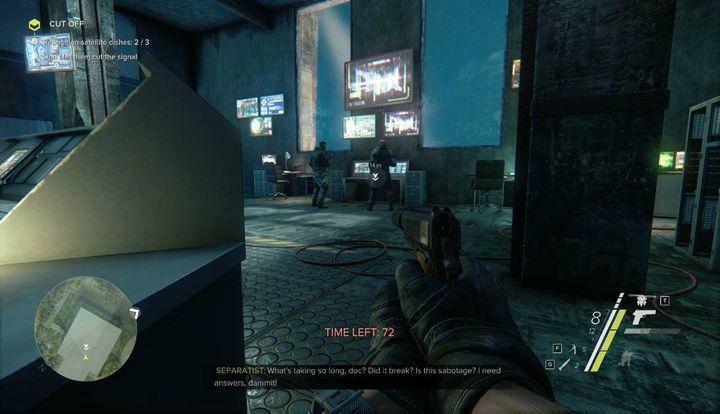 Interrogate him and reach the server, located on the ground floor, on the other side of the building. You could destroy everything that stands in your way but there are enough soldiers in the building to kill you instantly. If you want to complete the optional task: no alarm, get back to the basement the same way you got to the building in the first place and look in front of you. You should notice a channel between the trees. Use it to get to the other side. Just turn right and then left. You should reach the place presented in the screenshot. 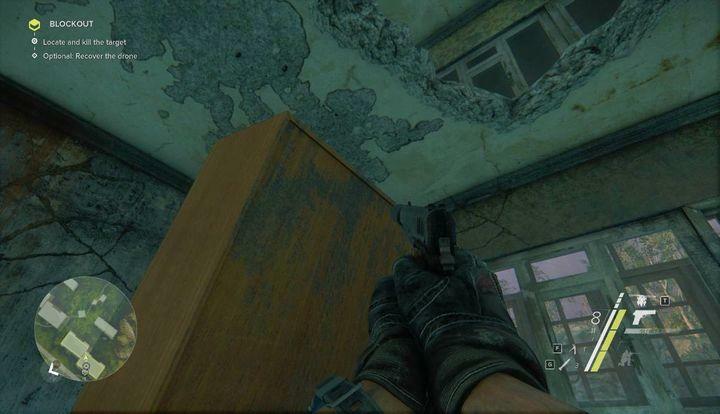 Use the hole in the wall to access the staircase, get to the first floor and reach the room that was previously blocked. You will get inside with the magnetic card obtained from the scientist. Now, all you need to do is exit the area. Use the same way you came inside and you can be sure that you will complete your optional task. The mission will start automatically once you complete act I. 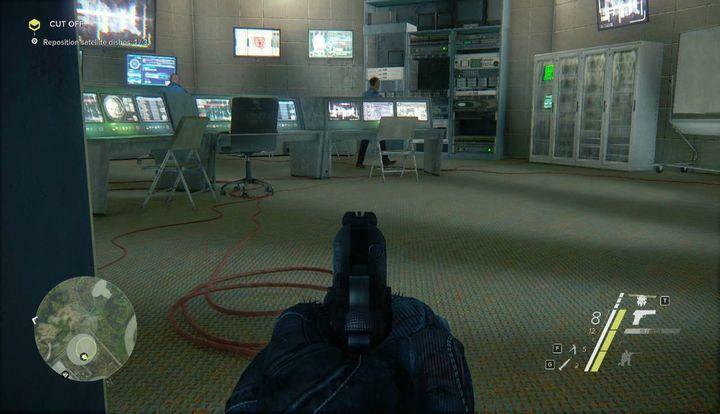 Your job is to infiltrate hostile HQ and find clues that will lead you to the shooter. Eliminate two soldiers patrolling the cave. Exit the cave and head to the location marked on your map. On your way you will come across two more soldiers. There are two entrances on the left side of the building: the main door visible in the screenshot and a window that you can reach with a ladder (on the left of the entrance). The order in which you will gain information is not important. Go to the basement and ignore the guard on the mezzanine. Investigate the dead body and the computer. There is a separatist in the next room – you may want to take him out. Head to the mezzanine. There are two enemies in the left room. If you want, you can eliminate them silently with your knife (essential to complete your optional task). Check the map located on the table, go back to the basement and use the compute one more time. Remember! Before you leave the area, you can eliminate one of the Most Wanted – Amin Nabiyev. He is on the first floor. The second part of the mission will require you to go to the church. It’s best to use the side entrance presented in the screenshot (you will find guards next to it). One of the soldiers will be standing by the wall, while the other one will be patrolling the area. You can easily get rid of them and you won’t raise the alarm. There are three clues in the church: a bloodstain in the middle, a bullet mark in the floor, on the left, and a hole in the wall (above the door that you used to get inside). Use the scout mode to find them. Once you find all three clues, use the rope to reach the lower level and use the nearby car to reach your destination. Once you get there, you will have to reach the top. Use the stairs and follow the streamers. 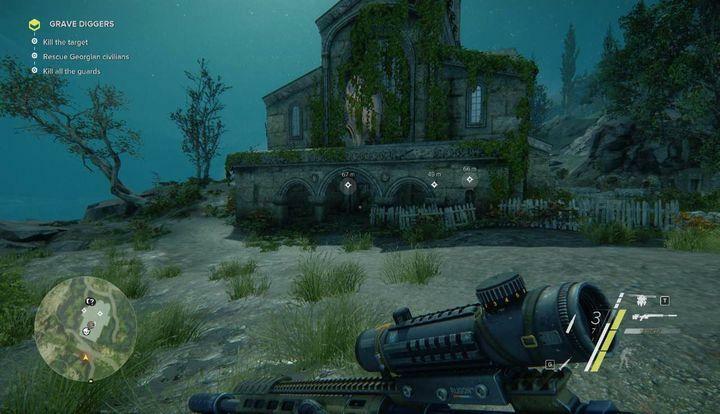 Once you get close to the church, approach the first wall and use the scout mode, and climb up to find traces of the sniper. There are some traces on the left of the church that will lead you to your destination. You will come across anti-personnel mines, so keep the scout mode active. Leave the area to complete the mission. You will have to go back to your hideout and use the laptop to begin your next mission. Use the narrow passage, marked on your map, to reach the mountain. When you reach the place presented in the screenshot, use the scout mode to find out where you can climb. Reach your destination, crouch behind the pillar and use your drone to scan the area. Your task is to eavesdrop on an important conversation and interrogate one of the conversationalists. Stick to the right side of the rocks and reach the place presented in the picture. 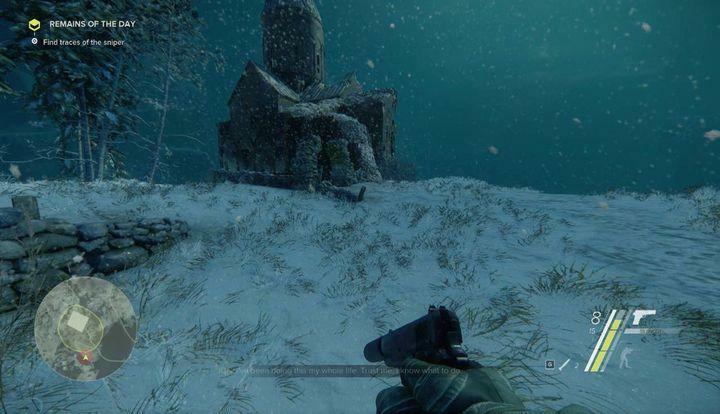 You will have a clear view of the entire area and you will be able to get to the ruins easily. To eavesdrop on the conversation, hide behind the closest pillar on your right. Once the conversation is over, the separatists will split up, and your target will stand on a small hill (he will be on the phone). As soon as he finishes the call, sneak up to him and interrogate him. 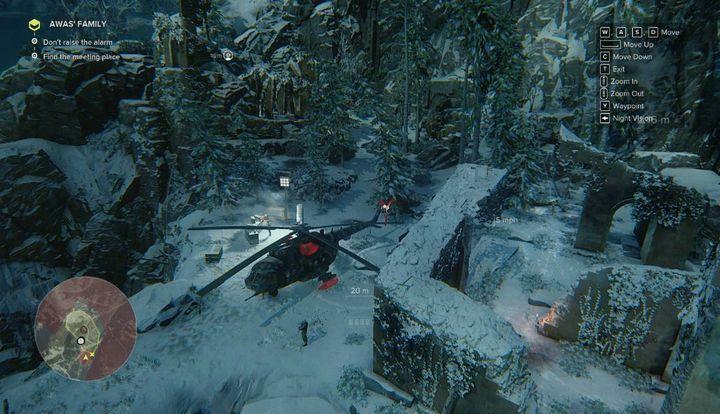 You can leave the area and complete the mission, or secure another hostile outpost. One of the hostile soldiers is a Most Wanted criminal- Lt. Boris Druganin. You will have to go back to your hideout and use the laptop to begin your next mission. You will start in a neutral zone, so unless you start a fight, the guards will not attention to you. Approach the bookmaker located in the middle and find out more about Awas’ location. The very bookmaker won’t share the info, until you bet your money on one of the fighters. In order to win, you should bet on Onavari. After a short cut scene, you should head to a shelter not far from you, and speak with Madame Roux. She will reveal some useful information on Awas’ location (it will be marked on your map). 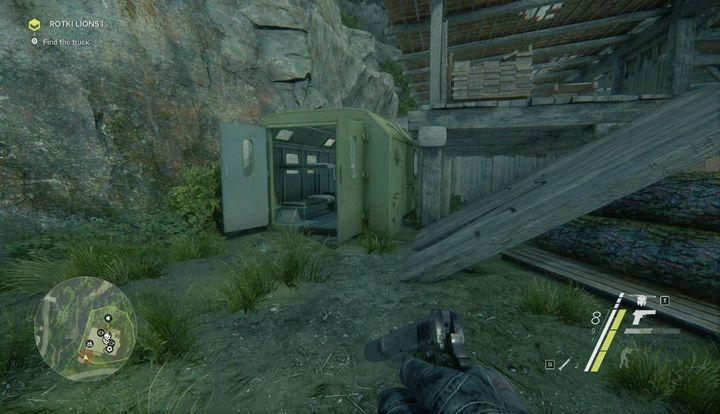 Go to the barracks and use the elevator (hidden in the container, behind the patrolling soldier). Use the red button to activate the elevator. The mission will end automatically as soon as you exit the barracks and the area. You will have to go back to your hideout and use the laptop to begin your next mission. Reach the destination and you will notice some guards. 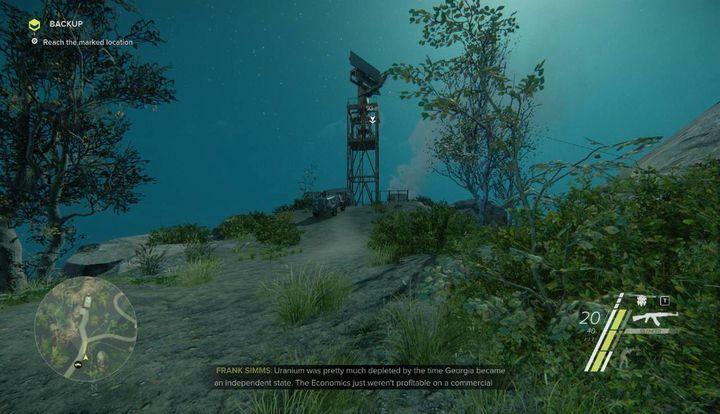 Eliminate them and climb the radio tower to begin the actual mission. Your task is to cover one of your allies, while he will be infiltrating the facility. Crouch and use the bipod to steady your rifle, and follow your ally. 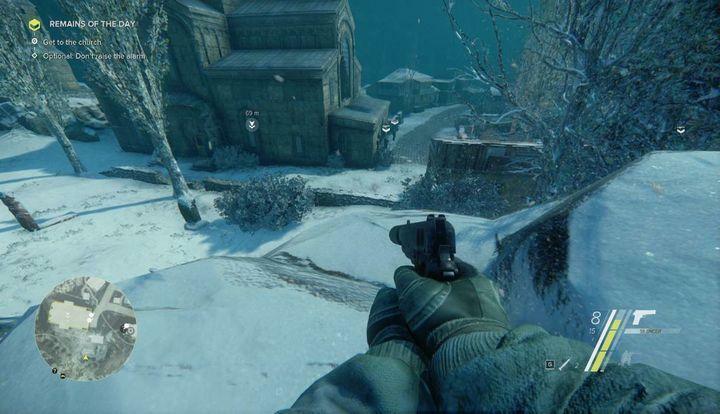 The agent will tag targets that need to be eliminated. The first one is the guard, located at the top, about 260m away from you. Set your scope to 300m, and after checking the wind, take the shoot. Your next target is 250m away from you. Wait for the soldier to pass the pipe and take him out. You should always pay attention to the wind. Now, you will have to monitor the agent’s position. At one point, one of the soldiers is going to enter the building with the agent, and you won’t have much time to eliminate him. The last target is by the next building. Wait for the right moment and shoot the soldier on the right. The one on the left will be eliminated by your ally. You may now leave the area, or eliminate all the remaining enemies in the facility. You will have to go back to your hideout and use the laptop to begin The Lair. Head to the main HQ marked on your map. You should reach the location presented in the picture. There are rocks on the right that you can climb. You should do it, as it’s a perfect spot to begin the infiltration. Use your drone to scan the area. You will have to tag four soldiers but there are more of them in the area. 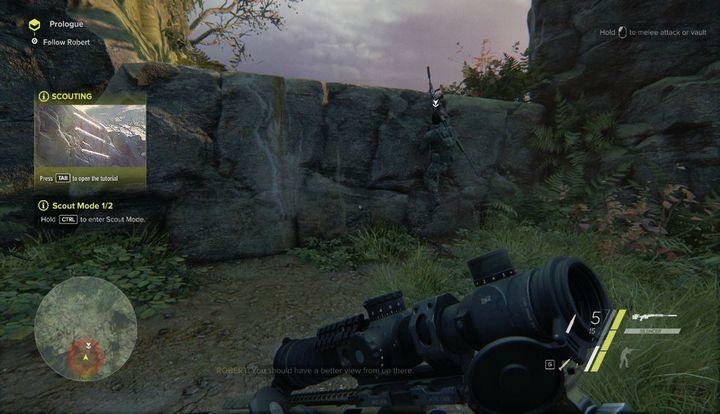 Draw your attention to the highest construction – a sniper is hiding there. First, eliminate the soldier scanning the area – he is located in the highest watchtower. From there, you can access stairs that will take you to the highest spot in the location. This will allow you to eliminate the hostile sharpshooter. 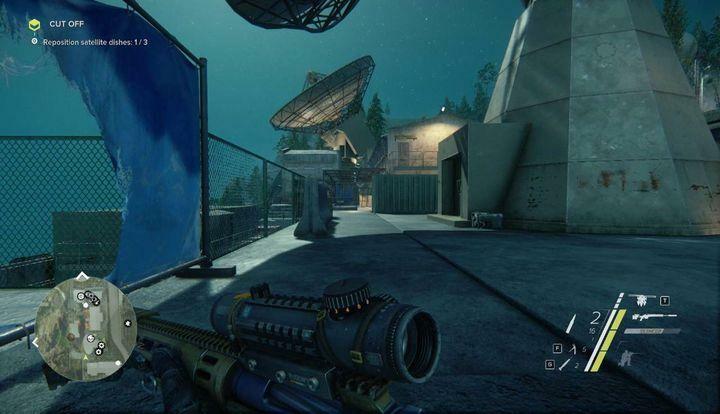 While infiltrating the facility, you will have an opportunity to pick your first collector’s weapon – M21 SWS. It’s in the building marked with a question tag. To be specific, it’s in the basement. There are also explosives that will come in handy during your next mission. If you didn’t clear out the facility, you will have another chance during a one of the side-ops Clear Out. 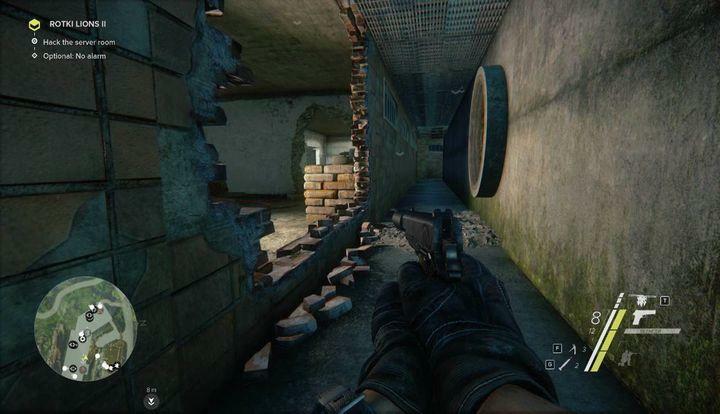 There are three enemies by the tunnel and it would be wise to eliminate them. Wait for the armored soldier to hide behind the booth on the left, and kill him. The remaining two enemies are by the entrance. Another soldier is in the very tunnel, and he will be looking at the entrance. Don’t hesitate to take care of him. Now, use the CCTV server and gain access to security cameras. The alarm will go off and you will have to use the air shaft in the next room. If you are in the middle of Clear Out, you will have to plant explosives that you collected from the barracks previously. The map will mark the right these three places. Escape through the air shaft and exit the area to complete your mission. Can the Nintendo Switch survive a variety of bends and twists test?